Social workers are a critical part of the palliative care team, bringing unique skills and strengths that underscore the whole-person, patient-centered approach at the heart of palliative care. Enhancing and expanding those skills—including leadership, communication, empathy and resilience—is a lifelong pursuit. Core Concepts in Palliative Care—Social Workers, will provide you with a deeper understanding of the multidisciplinary roles in palliative care and deliver new skills and strategies you can use to support patients and families experiencing chronic or life-limiting disease. This curriculum explores important concepts like values, ethics, mindfulness, critical thinking and relationships, self-care, resilience, meaning-making, dying, and grief in the care of these vulnerable populations. Originally created in partnership with one of the largest healthcare organizations in the United States, this course has been expanded and enhanced with additional content applicable across any health system. 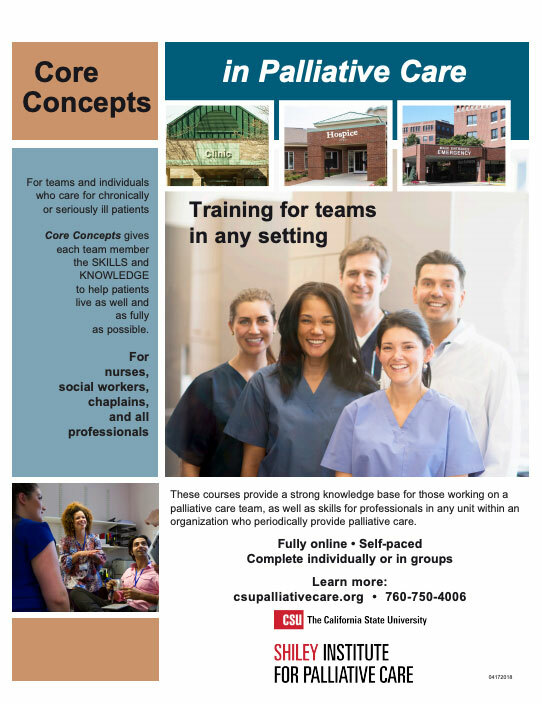 It’s perfect for individuals or teams interested in improving care for their most vulnerable patients and families. Core Concepts in Palliative Care—Social Workers offers 10 Continuing Education Hours that will enhance your practice and boost your effectiveness in supporting seriously ill patients. Studies show palliative care can improve patient outcomes, reduce hospital readmissions, lead to more effective decision-making, and boost employee satisfaction and retention.